Announcing the 2015 TLRC High School Scholarship winner! The Lackawaxen River Conservancy is pleased to announce that Michael Jacob Burkhardt, is the winner of the 2015 Scholarship for high school seniors. Michael, known to his friends as Jake, graduated from Western Wayne High School in Lake Ariel, Pennsylvania. He received his award at the Senior Assembly on June 9, 2015. The award is $500. 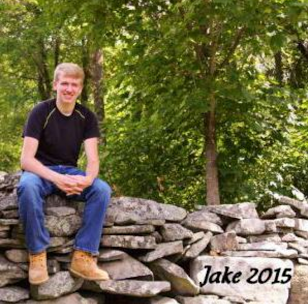 Jake plans to attend Keystone College in La Plume, Pennsylvania, where he will major in wildlife biology. An excellent student, Jake is a member of the National Honor Society and has been involved in Future Business Leaders of America and Envirothon as well. He has indulged his passion for the outdoors through hiking, skiing, farming, camping, and fishing on the Lackawaxen River with his dad. He has also done research at the Lacawac Sanctuary and Biological Field Station. Despite his busy schedule, Jake has worked part-time since he was in the ninth grade.